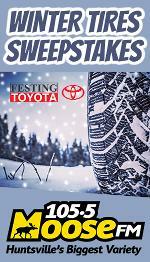 Prize: Enter to Win a set of 4 Winter Tires plus installation* to help keep you safe on the roads this season! *Up to a value of $1000. What you must do to enter: fill in form - may have to pick up at dealership- in Huntsville, ON? Statistics: This contest was opened by 123 and entered by 9 ContestChest.com members. 7% of those who opened the contest, entered it.